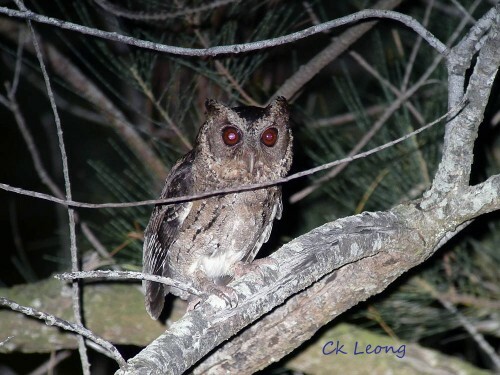 The Sunda Scops-owl Otus lempiji is probably the most common owl found in disturbed lowland forest throughout Sabah. It is best located by listening for its whooping single call uttered at intervals of between 8 to 15 seconds. Its size (20-23cm) might give you some difficulty in locating it though it responds readily to calls. Taking photos of the bird in the dark required some luck (the bird stayed!). Thanks to Brigitte, who provided the very necessary lighting assistance. The red eyes in the photos are due to the reflection of the torch light. 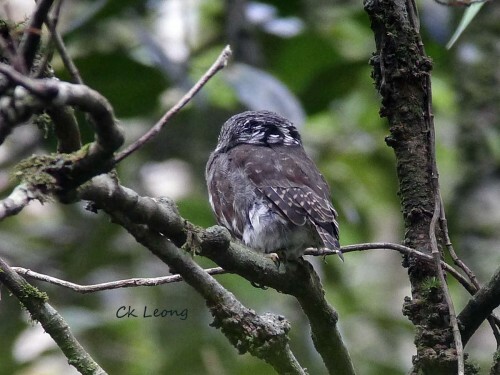 I have heard it call, I have seen it flying away, but I have never had a proper view of the Collared Owlet in Borneo. Until now. This endemic subspecies G. b. borneense has a different call from the others from Mainland Asia. 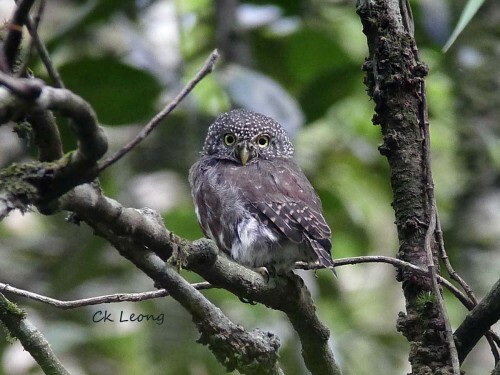 But together, they keep their status as the smallest owl in Asia (16cm). In Borneo, it prefers the montane forest but has been seen in lower habitat. Special thanks to my friends – Eyebrowed Jungle Flycatchers, Yellow-breasted Warblers, White-throated Fantails and Bornean Whistlers – their combined effort led me to this bird. 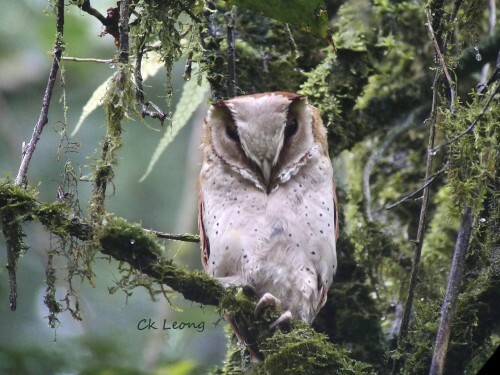 The Oriental Bay Owl Phodilus badius is supposed to be a bird of the lowland forest but here is one up at Kinabalu Park, just over 1,500 metres above sea level. A definite altitude record for this beautiful owl. It was perching upright against the trunk of the tree, perhaps giving it additional stealth in this daytime roost. When I took this photo in fading light, the bird was just slowly opening its eyes. I think it would be great fun for someone who has never seen this bird before to spot the location of the eyes when they are closed. Thanks to Andy Boyce and Adam Mitchell of the University of Montana Avian Life History project. 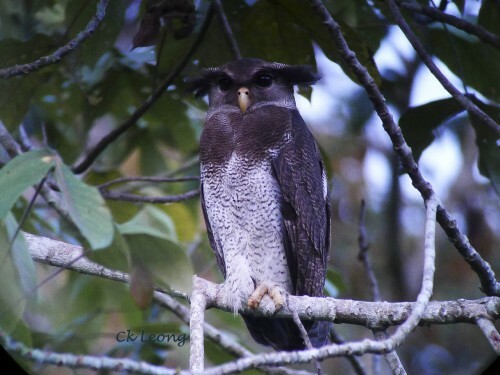 The last of the 3 large owls in Borneo, the Barred Eagle-0wl ! While less common than the other 2 large owls, it has been kind to me, showing up in most of my trips. It is found in lowland and swamp forest. Many years ago, I saw a young bird in a cage. I was amazed by the whiteness of its plumage but to see one in natural surroundings is so much better. So I got lucky. 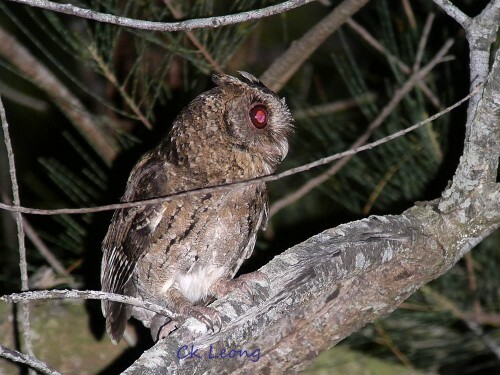 Yes, you would have to, to see this nocturnal beauty on a daytime roost. 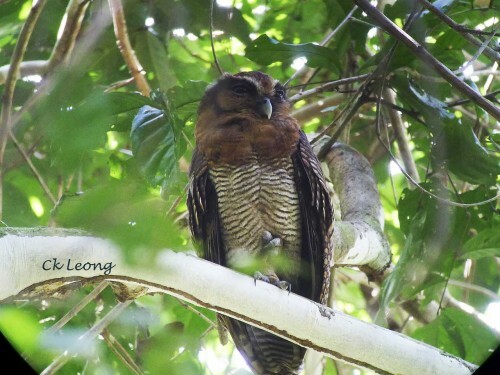 The Brown Wood Owl Strix leptogrammica is locally common in the edge of dense lowland forests. On a night drive around the roads of Tabin Wildlife Reserve, consider yourself to be very unlucky if you don’t see this bird. Of course in the bright illumination of the spot light, darker birds might appear to be pale.